To stay updated with NET's activities and upcoming events please visit our blog. September 7-10, 2017 in Capri Island, Italy. 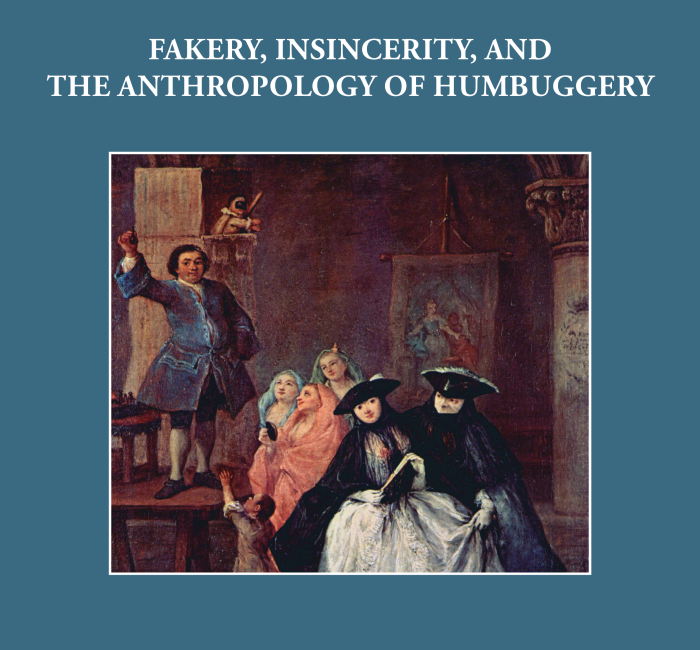 The EASA Network of Ethnographic Theory (NET) has completed a workshop entitled Fakery, Insincerity, and the the Anthropology of Humbuggery. The workshop took place on September 7-10, 2017 in Capri Island, Italy. The workshop was convened by Giovanni da Col (SOAS) and Theodoros Kyriakides (Open University UK), and included the participation of Susan D. Blum (Notre Dame), Harri Englund (Cambridge), Niloofar Haeri (Johns Hopkins), Michael Herzfeld (Harvard), Angelique Haugerud (Rutgers), John L. Jackson (Upenn), Michael Lambek (Toronto), Rena Lederman (Princeton), Sasha Newell (Université Libre de Bruxelles), Sherry Ortner (UCLA), Andrew Shryock (Michigan), Carlos Londoño Sulkin (U of Regina), Madeleine Reeves (Manchester), Angela Reyes (Hunter College, CUNY) and Alexei Yurchak (UC Berkeley). The workshop explored and situated notions of deceit, fakery, lying, humbuggery as essential parts of sociality, intensified by contemporary social and political processes. A publication, stemming from the papers presented at the workshop, is being prepared for early 2018. NET held a panel at the EASA conference in Milan 2016 on the theme of TACTICS AS ETHNOGRAPHIC AND CONCEPTUAL OBJECTS. The panel was convened by Theodoros Kyriakides and Patrick Laviolette. One of the advantages of a focus on vitalism is to go beyond a simple opposition of life and death. Such a step allows us to explore how the dead constitute a source of vitality for the living but also how the dead themselves may lead post-mortem lives. And vitalism also leads us beyond an opposition of the human and non-human, suggesting the numerous ways agency may be distributed across a spectrum of vitality. But vitalism’s obviation of these well-worn oppositions leaves us with a question: against what is vitality itself measured? What is the ground against which the various “thresholds of life” constitutive of vitality come to the fore? I try in this paper to provide one tentative, and ethnographically particular, answer to this question, by exploring the ways in which elemental phenomena can form the ground against which the measure of vitalism is taken. My topic is perhaps the most elusive of such phenomena: the sea. It could be said that the sea is “good to think with”; it’s certainly been subject to millenia of literary, scholarly, and popular reflection across cultures. Yet it is striking how, even within the same tradition, the sea is as likely to stand for human finitude and death as it is to stand for abundance and life. Its relation to vitality is both shifting and ambiguous. My current project is to sketch out the conceptualization of the sea within Gaelic culture. Drawing from both myth and literature, but also from ethnographic fieldwork with contemporary Gaelic-speaking fishermen in the Outer Hebrides, I seek to elucidate how the sea is used to reflect upon the limitations of human vitality, how it is both good to think with and, sometimes, good to live with. The particular focus of this paper is the tide, and the way its cyclicity casts light upon the ebbs and flows of human life on the Atlantic edge. The French term ‘terroir’ has entered the English language carrying more or less the same viticultural and culinary references. Despite its close English-language cousin ‘terrain’ and ‘territory’, terroir is a lot more than things having to do with the earth. It is a particular and dynamic ‘compositional assemblage’ of all elements that contribute to the unique qualities of a product (be it wine, foie gras or mushroom): climate, weather, topography, soil, precipitation, drainage, exposure to sunlight (duration, direction, intensity, etc. ), disasters, cultivar, ecology (including flora and fauna), human intervention (e.g. irrigation, fertilisers, weeding, introduction of cultivar and other bio-elements, fermentation and other procedures, craftsmanship and handling), etc. The construction and privileging of terroir is a reaction against ‘soulless’ mass production, against food and drink with no traceable origin because they have been industrially produced, mixed and packaged. I propose to look at the production of power-laden religious sites through the lens of ‘ritual terroir’, using examples from Chinese religious practices (some of which are drawn from my own fieldwork). Just as food and drinks, some religious practices are extremely translocalisable and even as they are always adapted to specific local conditions as they spread across the globe (e.g. Zen Buddhism, evangelical Christianity, Tibetan Buddhism, post-colonial and post-Cold-War Islam), many thrive precisely because of a delinking between the practices and any particular site or terroir. On the other hand, some other religious practices are resolutely spatially grounded in the production of specific religious sites and drawing spiritual power from these sites. One example is the development in the past two decades or so in Taiwan the practice of groups of seekers converging upon particularly spiritually-hospitable temples or other religious sites for collective sessions of spirit possession (the practice is called huilingshan or ‘converging upon spirit mountain). These spiritual practices take advantage of the existing elements of the terroir (e.g its qi field, its reputation in the overall landscape of religious sites, its particular spatial configuration, etc.) but significantly add an entirely new genre of ritual practice, thus enriching these sites as ritual terroirs. Some comparative insights will be drawn from pilgrimage studies. Sacrificial practice in China was intimately concerned with notions of vitality and the generation and re-generation of life. Indeed, concern with vitality was one of the animating issues underlying many of the debates surrounding sacrificial practice in China, the competing forms sacrificial practices took over time, and the repeated emergence of anti-sacrificial movements. In this paper, I will explore the complexity of these rituals as well as the indigenous theories of vitality that were the focus of such intense activity and concern. I will argue that these practices, as well as the indigenous theories implicit and explicit in these practices, have much to offer our larger comparative understandings of vitalism. “Killing animals” refers both to humans as animals that kill and to the act of killing animals. This paper looks at three contexts in which killing, violence and life-giving take very different configurations. It starts by reflecting on large animal sacrifices in Sumba as a source of reflections on the evidence for apparently similar practices in the Neolithic site at Çatalhöyük. It then turns to current discussions of hunter/prey relations in the subarctic. Finally it considers recent writings about animal rights activism in South Asia. In juxtaposing these highly contrastive situations, the paper aims to bring into relief some of the ambiguities of violence, its place in animal/human relations, and the very idea of “life” itself. Following twenty-five years of war which divided the “Sinhala south” from the “Tamil north,” increased mobility to spaces of shared Buddhist-Hindu religiosity appear to be emerging as potential sites for ethnic reconciliation in Sri Lanka. What happens though, when evangelical Christians claim that Christianity can build a “bridge of peace,” and provide a “Universal” faith that can accommodate both ethnicities and reconcile differences? The notion that there are “territorial strongholds” held by demonic spirits has animated the evangelical Christian imaginary for the last several decades. Evangelists regard the equatorial zones to be especially rife with demonic activity (DeBernardi 1999, 2008). Sri Lankan Pentecostal Christian evangelists discern that locus of demonic activity within their own country can be found within Sri Lanka’s southern coastal zones that accord to regions where Sinhala sorcery and ‘exorcism’ rituals are prolific, and to shrines for deities which are sites of pilgrimage shared by Sinhala and Tamil Sri Lankans. Regions considered by Buddhist and Hindu religionists to be hallowed grounds are being claimed by evangelical Christians as battle grounds for spiritual warfare. While many Sri Lankans look to Hindu-Buddhist deities for succor to navigate the troubles of everyday life (laukika, mundane concerns), and Sinhala Buddhist nationalist reformers and revivalists try to set ordinary folk on a path towards the “real Buddhist” supra-mundane concern (lokkotara) of nibbana, evangelical Christians propound methods to root out evil from these regions by supplanting demonic strongholds by spreading the Good News (Subha Aranchiya) in preparation for the coming End of Days (lokeya winashath). What logics of sacrifice are at play, and how do they contribute to contrary senses of religious sovereignty? How do such conflicting practical-theological interpretations lend to the reading of dystopic and utopic potentials into the multi-religious landscape? What do these competing efforts to inscribe and reinscribe the sacred into this landscape mean for inter-religious and inter-ethnic relations in post-war Sri Lanka? The nature of human life, its pliability and applicability, its diversity and its open-endedness, seems again to be shaping anthropological debates about subjectivity and political formation in the context of (pre-/post-)ecological crisis. In the urban domains, these debates revolve around increasingly dominant notions of human flexibility, adaptability and resilience within technological and cybernetic systems of self-repair, while in the literature relating to the notion of the Anthropocene similar ideas of human being as subsumable to Gaia are emerging. In this paper I will reflect on how these perspectives imply a paradoxical human figure: On the one hand they convey a being that simultaneously infuses, consumes and transmogrifies the world; anthropocening it. Conversely and simultaneously, the human figure is forged by theoretical and analytical orientations that prescribe that one should recede from such a hierarchical and human-centric reading of the world. The latter aspect of the lesser human is particularly evident in that the search for non-human-centric perspectives sometimes involves ideas of human self-sacrifice, i.e. the need, if taking notions of the Anthropocene seriously, of becoming less through reinventing humanity and human life (without capital letters) as more adaptable to imminent dys-/u-/eco-topias. In this paper I will trace the emergence of this paradox – of a hyper-infusion and anthropocening of the human into the world and a notion of humans oriented to become less. Through examining notions of politics in urban contexts as well as attempting to trace implications for (neo-)vitalist thought, this paper will explore anthropological implications of this paradox. Drawing upon recent research in Southern Mexico on the politics of renewable energy transition, as well as ongoing involvement with low- and post-carbon activism in the Global North, I discuss here imaginations of sacrifice within anthropocenic politics. On the one hand, indigenous communities in places like the Isthmus of Tehuantepec are hailed (by corporations and states) to sacrifice their land and traditional lifeways in order to participate in a particular utopian project: the constitution of a sustainable green capitalist economy. On the other, any number of activist initiatives in the Global North freely advocate the sacrifice of fossil fuels in favor of renewable energy while, at the same time, only rarely grappling with the modern lifeworld that would be lost were carbon energy magnitudes and infrastructures rapidly abandoned. These two sacrificial logics are imbricated with a further utopia: that the Global North can continue to consume increasing quantities of emissions-intensive goods (produced now in the Global South) and yet save the world through greening their own national energy supplies (let’s call this the Danish Paradox). In sum, I am interested here in the various positionings of sacrifice (and salvation) that are emerging as the world faces perhaps its greatest ‘vitalist’ challenge: coming to terms with the end of a carbon-fueled society. How do people attempt to create a radically different future by taking action in the present and what challenges do they face? Analysing the relationship between the future, the present, and the past, this paper takes the case of the spread of armed underground Maoist guerrillas in India to ask two questions: First, why does India hang on to this form of utopianism when the rest of the world appears to have abandoned it? Second, how and why does the 'muck of the past' influence the production of their utopia? In answering these questions, this paper explores the dialectical relationship between ideology and politico-economic forces of history paper in our theories and praxis of radical social change. It explores how utopia and dystopia are inextricably linked. Pacifism is often seen as a utopian commitment. It is based on the assumption that human beings are perfectible and contain within themselves the capacity to live better, more peaceful lives. Yet, pacifists face a problem of how to bring their commitments into being. Put bluntly, what happens if future peace can only achieved through violence in the present. Or, alternatively, what happens if a commitment to pacifist principles in the here and now results in the death of other people, in the name of a future peace that was yet to come? Focusing on Second World War Britain, this paper explores how pacifists sough to overcome the temporal fissure of pacifism, by collapsing means and ends. It particular, it looks at the example of pacifists who served with the Friends Ambulance Unit, often very close the front line, forcing them to cooperate with the military. These pacifists tried to create a peaceful sociality through a form of self-sacrifice. However, such sacrifices were constantly on the verge of turning from the productive to the destructive, the peaceful to the violent. The paper concludes by examining the relationships between life and death, tragedy and optimism, the possible and the pragmatic in the struggle for a pacifist utopia. In this presentation I propose to address the correlation of utopia and optimism, and see how it correlates with idea of personal and collective sacrifice. To do so, I will invoke my interactions with members of the so-called Revolutionary Movement - a group of young activists challenging the ever-lasting rule of José Eduardo dos Santos and the MPLA in Angola. During my last fieldwork experience in Luanda (2015), I observed how most of the "Revús" (as they are known) engaged in self-sacrificial behavior, exposing themselves to police brutality, imprisonment and social discrimination, in their struggle towards a brighter collective future. This optimistic and somewhat Gandhian (nonviolent resistant) stance marks, in my view, a dramatic departure from the more overarching sense of fatalism and 'culture of fear' (cultura do medo) that seems to prevail in the country. I will question if and in what terms such stances are 'utopian' and configure 'principles of hope', as Ernst Bloch would put it. In the process, I will perform a critical interrogation of the seemingly undetachable association of utopia and optimism. Remarks on the reunification of art and life. The central concern of the esthetic utopia, since it was first proposed in the late eighteenth century, has been to overcome the division of art and life. In this paper I will look at this division in what Rancière has called the “esthetic regime” of art, the discursive practices that have aimed for the esthetic utopia in the last two centuries. One side of this division, the concept of “art”, has often been subject to criticism; and yet the concept of “life” appears self-evident. But what is this “life” that “art” aspires to reunite with? That is the initial question I will propose to address. For doing so I will focus in a particular line of thought within this regime, a line that runs at least from Henri Lefebvre and Guy Debord to Nicolas Bourriaud. Situationism in particular, connected the reunification of art and life with the Marxist critique of alienation. But their notion of a (re) unified life is also influenced by anthropological theories of the gift in Mauss, and Bataille’s thought on the potlatch and sacrifice. I would like to explore these connections further in my presentation. In the conclusions, I will explore how these approaches differ from other theories of “life” in anthropology that are also inspired by the esthetic utopia, like Tim Ingold’s vitalism. This paper will explore the vital impetus that enables a group of Argentine trade unionists to continue in their activism, informed by visions of past golden eras from the mid-20th Century, and possibly now the more immediate past of 2003-15. Peronist unionists often explain their activism by emphasising inherent characteristics such as vocation for service, rage against injustice, susceptibility to the ‘virus’ of political passion, or love for others. How does this translate into action on the world? NET has successfully conducted its first workshop on the theme of VITALISM, SACRIFICE AND UTOPIA. 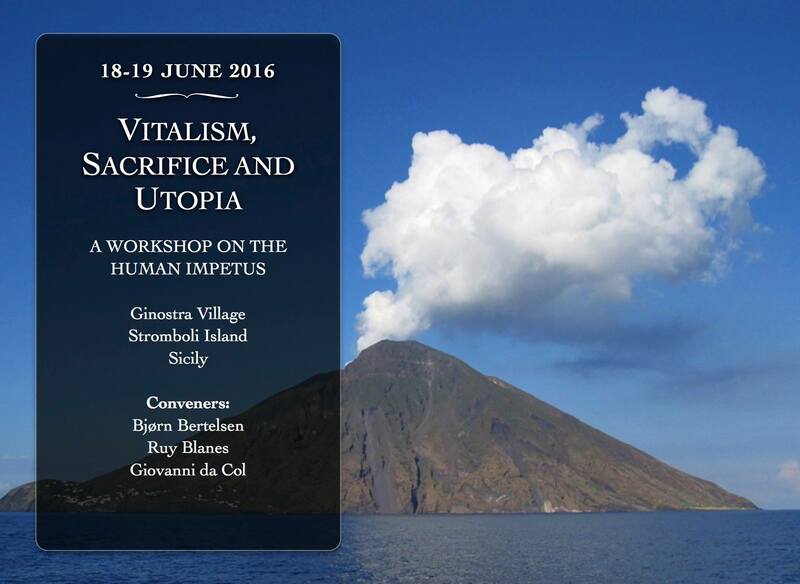 The workshop took place on 18-19 June 2016 at Ginostra Village, Stromboli Island, Sicily. It was convened by Giovanni da Col, Ruy Blanes and Bjorn Bertelsen. Participants included Webb Keane, Dominic Boyer, Michael Puett, Tobias Kelly, Alpa Shah, Magnus Course, Roger Sansi-Roca, Neena Mahadev, Sian Lazar and Adam Chau. The workshop was sponsored by NET and the University of Bergen.